Nearly two years ago, Superstorm Sandy crashed into New Jersey, destroying hundreds of homes along the Jersey Shore and doing billions of dollars in flood damage to thousands more. Entire communities along the beaches and bays were dealt a withering blow by this class 3 hurricane, which left a swath of destruction totaling over $62 billion. 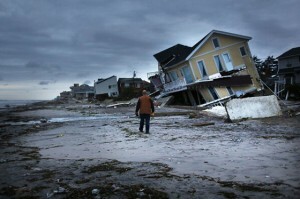 Sandy was the second most costly storm in U.S. history, topped only by Hurricane Katrina in 2005. Adding a human cost to the damage done, 125 people lost their lives to this terrible storm. In light of such wide reaching destruction, it should be of little surprise that the areas effected by the storm are still struggling to rebuild. The storm recovery process has proven to be long and difficult, with issues of funding and tightening insurance standards slowing progress. 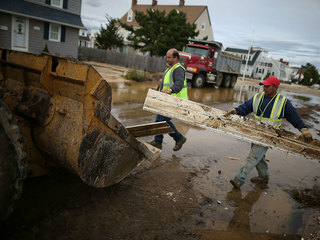 Despite these set-backs, New Jersey residents and the construction firms that serve them continue to make a concentrated effort to put all possible effort into restoring the shore; efforts that include rebuilding, hazard mitigation, and the acquisition of continued funding for storm recovery. Primary among New Jersey’s storm recovery efforts is the push to rebuild and restore properties effected by Sandy. According to Governor Chris Christie, over 72,000 homes and businesses were damaged by Sandy, with damage estimates ranging from $25-$40 billion. Construction firms have been flooded with restoration contracts from home and business owners alike. For those whose homes had been made unlivable, restoration meant leaving behind the temporary FEMA shelters which had been provided to them and moving back into their homes. For those business owners whose commercial properties had been damaged, restoration meant a return to profitability. But restoration doesn’t end with rebuilding. Another major focus of the Jersey Shore’s storm recovery process is hazard mitigation. Insurance and construction regulations in the period since Sandy hit have become increasingly stringent in an effort to lessen the damage done by, and thus the cost of, future storms. Home elevation has become a staple of storm recovery efforts, as new insurance standards require that a home be placed above newly established FEMA floodplain guidelines or suffer substantial insurance rate increases. Other emergency mitigation efforts include stabilizing existing dwellings, decks and walkways with bracings and pilings; re-grading eroded dunes; reconstruction of bulkheads and shoreline erosion structures that were functional before Hurricane Sandy; and repair or reconstruction of existing public roads, bridges, utilities and other public infrastructure, among others. It is a long, but essential process that has extended the amount of time it has taken to fully rebuild. Both rebuilding and hazard mitigation initiatives are largely dependent upon the acquisition of federal funding provided to support restoration efforts among the storm-affected areas. These funds come from the Community Development Block Grant (CDBG) Disaster Recovery programs of the U.S. Department of Housing and Urban Development . Those construction and restoration firms that have made storm recovery their mission have had to learn the intricate ins and outs of these government programs in order to requisition the maximum amount of funding to supplement the costs incurred by their clients. Every aspect of storm recovery, from rebuilding to hazard mitigation to funding, starts with choosing the right construction firm to handle your reconstruction project. Penn Jersey Development Company, an expert in home construction, restoration and elevation, can handle all of your storm recovery needs. Penn Jersey provides clients with a seamless beginning-to-end home restoration process. Whether your property needs flood damage repair or elevation, we have the experience, vendor relations, and funding acquisition knowledge to complete your restoration process in a professional, expedient, and cost-effective manner. Call today for a free consultation at 1.800.ELEVATE.